The Highlander remake is one of those projects that’s been bouncing around development hell for ages now, occasionally bobbing to the surface with some new rumors but always seeming like a terrible idea. Ryan Reynolds came and went as the prospective lead, and a dude named Cedric Nicolas-Troyan was set to make his feature debut as director of the film. Well, now the Highlander reboot reportedly has a very big fish in its sites: actor Tom Cruise. 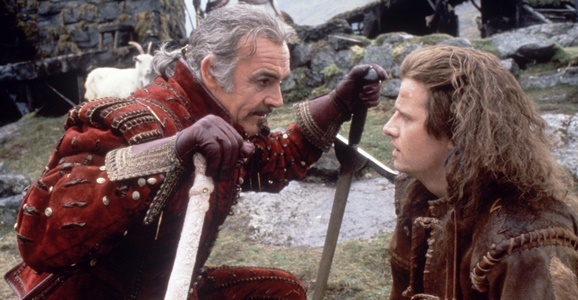 The Wrap reports that Summit Entertainment — the folks behind the Twilight movies, among other things — are currently “courting” Tom Cruise for their long-gestating Highlander revamp. They don’t want him for the lead, but rather for the “Sean Connery mentor role.” If your Highlander memories are a little rusty, Connery played Juan Sánchez Villa-Lobos Ramírez in the original film, an Egyptian pretending to be a Spaniard who wielded a katana and spoke with a Scottish accent. He took the recently undead-ed Connor MacLeod (Christopher Lambert) under his wing and explained the truth about the immortals who have been living among mortal man for centuries, forever battling each other to claim “the prize” — in the end, there can be only one. So, if Cruise does sign on for Highlander, I wonder if he’ll fare better than Connery’s Ramirez and actually make it to the end credits with his head still attached. With all of the amazing action and dark comedy happening in Doug Liman’s Edge of Tomorrow, you might be fooled into thinking nothing was left on the cutting room floor, but that’s certainly not the case, as seen in these newly revealed deleted scenes below. There aren’t any major spoilers here, but if you’re watching deleted scenes without watching the movie itself, you have bigger problems than that. Post by Edge of Tomorrow. Every year there are great movies that slip through the cracks and fail to find a theatrical audience. This year, Doug Liman’s sci-fi actioner Edge of Tomorrow is one of those, and probably the most notable. Despite almost unanimous critical backing, no one went to see this movie in the theater when it opened in June. There are a number of theories, including a terrible, generic title that says nothing about the film (something they’ve been playing with building up to the home video release), a mismanaged marketing campaign, and Tom Cruise fatigue among audiences. If theatergoers are really sick of Cruise, this actually could be the movie they’d want to see the most, because he dies, a lot, often in spectacular fashion. If you don’t believe me, just watch this new supercut of the various ways he buys the proverbial farm, and this isn’t even all of them. Edge of Tomorrow follows the exploits of Bill Cage (Cruise), a marketing executive who joins the military after an alien invasion happens and lends his particular brand of expertise to the propaganda war. Through a series of events, and a vindictive senior officer, Cage, who has zero combat experience, winds up on the front lines. In the midst of a Normandy Beach-style assault, he dies moments into the battle. But low and behold, he wakes up at the beginning of the day, very much alive. There’s been a lot of talk about how this past summer was a bad season for movies. We tend to disagree with this stance and think there were some great movies, and to be fair, many of those who argue it was a bad time for movies are coming from a box office numbers perspective, and we don’t give a crap about that. We did notice that one fantastic movie that was an absolute bomb in theaters (while dreck like Teenage Mutant Ninja Turtles and Transformers: Age of Extinction were big hits), and that is the Tom Cruise vehicle Edge of Tomorrow (or Live, Die, Repeat or whatever you want to call it). The movie hits the home video market soon (you can actually already buy a digital copy), and in advance of that we have a cool behind the scenes look at the production. Marvel’s Guardians of the Galaxy may be the most fun movie of 2014 thus far (audiences certainly seem to think so, as the film recently became the first movie of the year to top $300 million at the domestic box office), but Edge of Tomorrow isn’t far behind on our list. A big part of this is that the action sequences are incredible, fast paced affairs that blend practical and digital special effects with great results. More than anything, this video gives you a feel for how director Doug Liman and the crew used actual physical applications to give these scenes a more grounded, visceral feel. One of cinema’s most legendary leading men, John Wayne, was born with the name Marion Morrison. Heavyweight boxing icon Muhammad Ali was born Cassius Clay. Many Hollywood celebrities work under names that don’t appear on their birth certificates. Obviously inspired by all of these name changes, Warner Bros. has fully rebranded this summer’s Edge of Tomorrow with its catchy tagline Live. Die. Repeat. without looking back or even making a big deal out of it. Until they looked back and changed it again. 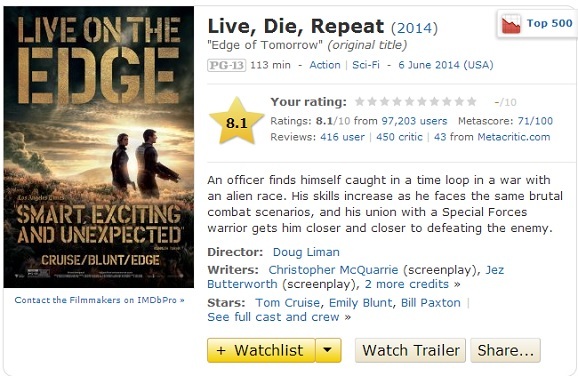 The Blu-ray/DVD pre-orders were our first clue that a name change was happening, and then IMDb made the switch yesterday, saying Edge of Tomorrow is the “original title,” while Live. Die. Repeat. is the current one. And then today? It goes right back to Edge of Tomorrow. 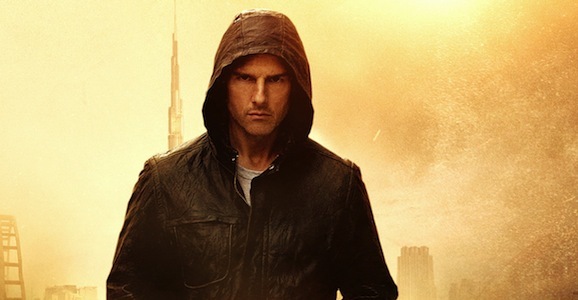 Tom Cruise Could Have A Cameo In Star Wars: Episode VII? Here is today’s installment of the please-god-don’t-let-it-be-true Star Wars rumors: Tom Cruise could have a cameo in Episode VII. We’ll give you a minute to have a spastic meltdown that will likely frighten any children or pets that happen to be in your general vicinity, but when you calm down, we’ll get into the specifics. The Mirror reports that the Minority Report star has been in London for a week, which, if you’re keeping tabs, is where Episode VII is currently filming at Pinewood Studios, or not filming, due to Harrison Ford’s broken leg. According to the article, Cruise has already met with members of the production staff, including director and writer J.J. Abrams himself, and the topic of discussion was trying to find a small role to fit Cruise into.